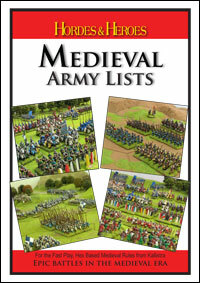 Your FREE copy of Hordes & Heroes Medieval and Army Lists are ready for download. 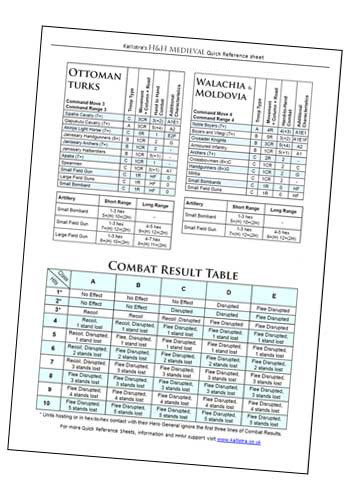 One A4 Quick Reference Sheet is sufficient to contain all the information necessary to play Hordes & Heroes Medieval. The main rules need only be consulted when players are learning the rules, and occasionally thereafter, to clarify situations as they arise. An example of a Quick Reference Sheet is shown below. It's quick and easy to generate the required reference sheets for your Hordes & Heroes Medieval Battle. Click here for more information.